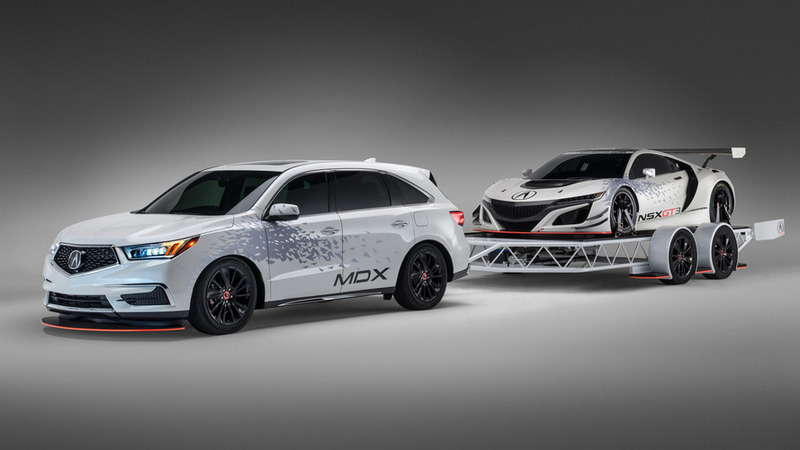 The Acura NSX GT3 is heading to SEMA, but since it’s a race car and can’t be legally driven on public roads, a 2017 MDX will haul it on a bespoke trailer. Joining the already revealed TLX GT Package in Las Vegas, the GT3-spec NSX will sit on its own custom trailer created by Acura in collaboration with the Jimmy Shine Workshop. The matching trailer takes design cues from the race car, as well as from the 2017 MDX in charge of doing the towing. Interestingly, the NSX GT3’s roll cage has served as inspiration for the trailer’s perimeter chassis, while the 20-inch wheels have been sourced from the facelifted three-row family hauler. The 2017 MDX will also feature some changes compared to the regular model, starting off with a similar livery to mimic the NSX GT3. It will also benefit from a sportier suspension lowering the ride height by one and three quarter inches to complement those black wheels taken from the Acura Genuine Accessories catalog of optional goodies. Lurking behind the large alloys are brake calipers with orange accents also noticeable on the front splitters of both cars as well as on the trailer. As a refresher, the 2017 Acura NSX GT3 brings a series of changes over its road-going counterpart. For starters, the race car has a rear-wheel drive layout and it eschews the hybrid hardware. While the second generation of the supercar uses a dual-clutch, nine-speed automatic transmission, the race-spec version is fitted with a six-speed sequential gearbox. The cars do share most bits and pieces part of the biturbo 3.5-liter V6 engine, with Acura saying the GT3 version has the same engine design specifications, including the crankshaft, block, pistons, heads, valve train, and dry-sump lubrication system. Another thing the two cars have in common is that both are being made at the Performance Manufacturing Center in Ohio. The GT3-flavored NSX is set to receive homologation from FIA this fall and will be ready for the 2017 racing season. Meanwhile, the race car will arrive at SEMA on its bespoke trailer on November 1 when the IMSA Weathertech SportsCar Championship and Pirelli World Challenge drivers are going to be announced. Acura's Precision Crafted Performance and motorsports resurgence will dominate its display at the 2016 SEMA Show in Las Vegas, Nov. 1-4. The Acura NSX GT3 race car, which will make its North American racing debut in 2017, will be featured on an NSX-inspired, custom-fabricated trailer, towed by 2017 Acura MDX wrapped in a matching racing livery. Building on the performance theme, Acura's GT3 racing partners, Real Time Racing and Michael Shank Racing, will announce driver lineups for the 2017 Pirelli World Challenge and 2017 IMSA Weathertech SportsCar Championship on Nov. 1. 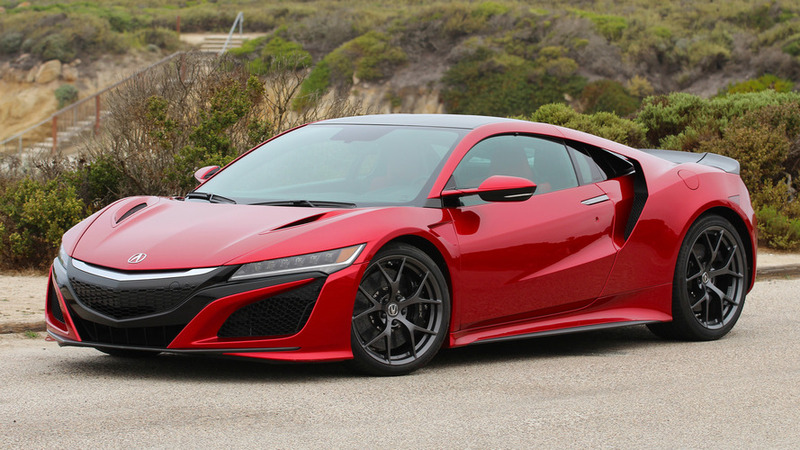 A 2017 Acura NSX supercar featuring factory-installed features and options as well as a 2017 TLX sedan with the new GT Package will complete the exhibit space. "SEMA is an opportunity to have some fun with customization concepts, and our approach this year is to showcase Acura's performance direction by literally connecting our GT3 racing program to our production models," said Jon Ikeda, vice president and general manager of Acura. 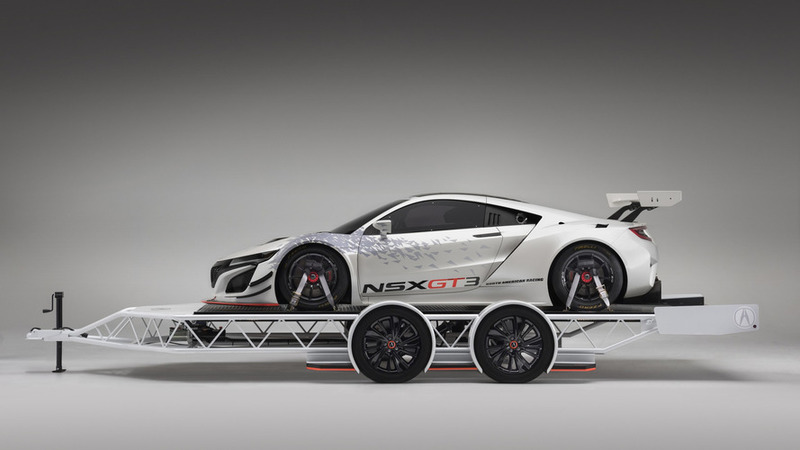 The custom NSX GT3 trailer is a joint collaboration between Acura Design, led by Dave Marek, Acura's Executive Creative Director, and the Jimmy Shine Workshop. The trailer incorporates design elements of both Acura vehicles, including a perimeter chassis inspired by the NSX GT3's roll cage and 20-inch accessory wheels adopted from the 2017 MDX, as well as running boards and a rear spoiler evocative of the redesigned MDX. The fully functional trailer features two hydraulic pumps powered by a 12-volt battery system that lift and lower the bed. The trailer is 112 inches wide and just over 23 feet in length and is powder coated in Pearl White to match the MDX and the NSX GT3. "We spent hours in CAD design creating a rolling, themed stage for the NSX GT3 race car," said Shine. "This is a 'next-generation' trailer that is completely custom to the NSX GT3 as well as the MDX." 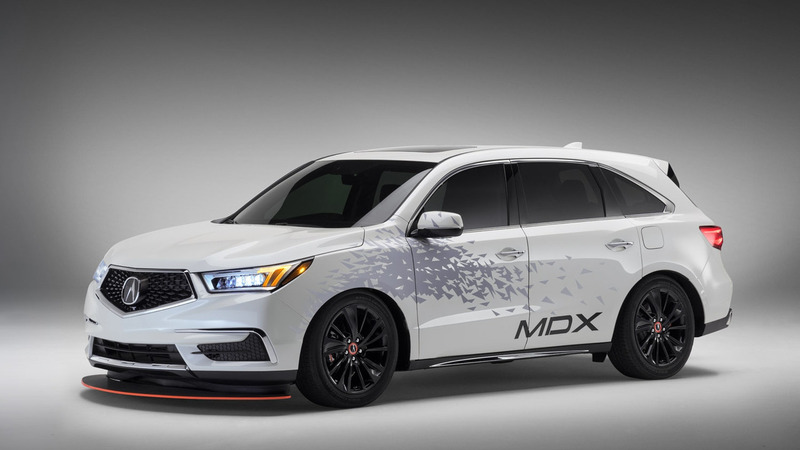 "We wanted to bring out the performance cues in the MDX to not only complement the race car and trailer, but to showcase a completely custom Acura race experience," said Marek. "SEMA is a great forum to push design and creative boundaries and this display evokes Acura's performance direction." The 2017 Acura MDX raises its game with bold new exterior styling, larger wheel and tire options and an expanded complement of premium features and technologies, including standard AcuraWatch™, which makes MDX the first luxury SUV to offer a comprehensive suite of advanced safety and driver-assistive technologies standard equipment (www.acura.com/mdx/features - AcuraWatch). The new MDX, America's all-time best-selling three-row luxury SUV, reflects the new Acura design direction including the adoption of Acura's bold and distinctive new diamond pentagon grille. It also features a more sculpted hood, front fascia, front fenders and revised Jewel Eye™ headlights. The result is a more "executive athletic" appearance for Acura's class-leading luxury SUV. Additional styling updates include new chrome rocker panel trim, a revised rear bumper and skid garnish and the return of visible dual exhausts with bright finishers. The Acura NSX GT3 race car features custom bodywork and aero components including a rear wing, underbody diffuser and enlarged hood vents for efficient engine cooling. The NSX GT3 is powered by a 3.5-liter, 75-degree, twin-turbocharged DOHC V6 engine using the same design specifications as the engine in the production 2017 Acura NSX, including the block, heads, valve train, crankshaft, pistons and dry-sump lubrication system. The engine will be paired with a 6-speed, sequential-shift racing gearbox, delivering power to the rear wheels. The NSX GT3 utilizes the production NSX's ultra-rigid and lightweight multi-material body with aluminum-intensive space frame, which is produced by the Performance Manufacturing Center in Ohio, the exclusive manufacturing home for the new Acura NSX. Its twin-turbocharged V6 engine will also be manufactured in Ohio. Acura products are produced using domestic and globally sourced parts. The Acura NSX GT3 race car will add to a rich legacy of Acura sports car racing campaigns and championships, including the 1991, 1992 and 1993 IMSA Camel Lights manufacturer and driver championships, and the 2009 American Le Mans Series manufacturer, driver and team championships in both the LMP1 and LMP2 classes. Acura recently completed its final campaign of a pair of Acura TLX GT cars with Real Time Racing in the Pirelli World Challenge. Commemorating Acura's racing heritage, the TLX luxury sports sedan can now be customized to deliver an even more aggressive and sporty appearance with the new TLX GT Package, available on TLX models at Acura dealers nationwide. Reflecting Acura's rich legacy in sports car racing, including its just completed campaign of the TLX GT race car in the Pirelli World Challenge, the TLX GT Package includes a rear decklid spoiler, front spoiler, side sill garnishes and rear underbody spoiler, along with an optional 19-inch Diamond Cut wheel and tire kit.